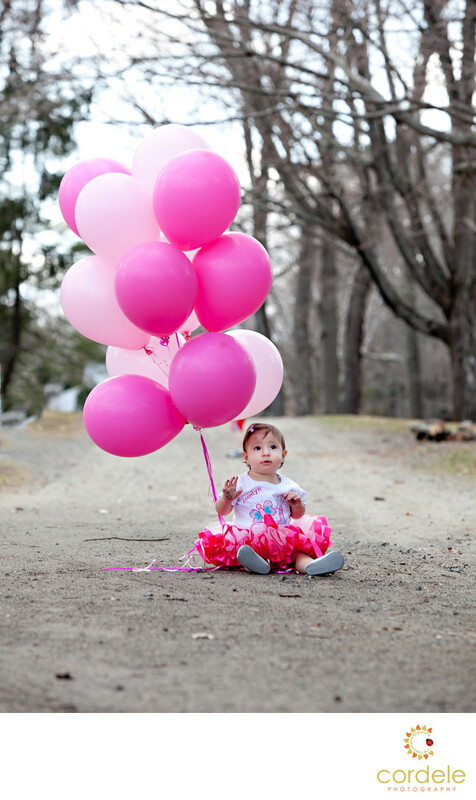 A little girl sits with balloons for her first birthday photo portrait in Danvers Massachusetts. This little girl is one of three kids. She has two older brothers who all did a year in the life session which captures the first weeks, 3 months, 6 months 9 months and one year. The problem with shooting this family so much was coming up with unique concepts for the shoots. The cool thing was that she was a girl. The mom thought that Endicott Park in Danvers would work well. there is a to to work with She also brought a few props and the balloons worked well. I love that she is wearing a shirt that says "1" on it and the pink proves to you she is a girly girl. Mom was so happy to get a girl after having two rough and tugged boys! Location: Endicott Park 57 Forest St, Danvers, MA 01923.